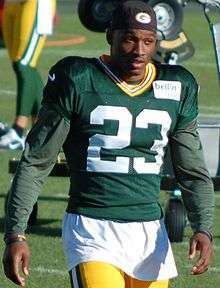 Damarious Wayne Randall (born August 29, 1992) is an American football cornerback for the Green Bay Packers of the National Football League (NFL). He played college football at Arizona State. Randall was drafted by the Packers in the first round of the 2015 NFL Draft. Randall played as a cornerback, safety and wide receiver and returned punts and kickoffs at Pensacola High School, earning all-state recognition as a senior and all-conference honors as a junior and senior. He helped lead the team to a Class 3A title as a senior in 2009, when the Tigers outscored their opponents 95-13 in the postseason. He also lettered all four years in baseball as a shortstop and four years in track & field, participating in the long jump (23'11") and the 4x100 relay (44.10 seconds). Randall played college baseball at Butler Community College for a year before transferring to Mesa Community College to play college football. He saw his first action in 2012 and recorded 69 tackles, ten interceptions and five total touchdowns. The next year he transferred to Arizona State University. He entered his first year at Arizona State and missed the first four games because of a lower leg injury and then started the rest of the season and recorded 71 tackles, three interceptions and a touchdown. As a senior in 2014, Randall started all 13 games. He finished the year with a team-leading 106 tackles, three interceptions, 4 forced fumbles, one sack and a touchdown. In the weeks leading up to the 2015 NFL Draft, Randall was ranked as the top safety in his draft class by NFL Media draft analyst Mike Mayock. He was projected a late first or a second round pick. Randall was drafted 30th overall by the Green Bay Packers in the 2015 NFL Draft. On June 16, he signed a four-year contract worth up to $7.9 million, with $6.4 million guaranteed, and a $4.02 million signing bonus. In week 6, Randall won the Castrol Edge Clutch Performer of the Week as he deflected a game tying touchdown pass from Philip Rivers. In week 8 against the Denver Broncos, he recorded his first interception, intercepting a pass from Peyton Manning. He recorded his second interception in week 9, intercepting a pass from Cam Newton. In Week 15, he had his first touchdown, returning an interception by Derek Carr for a touchdown. 1 2 "NFL Events: Draft Player Profiles - Damarious Randall". NFL.com. Retrieved 2015-05-12. ↑ Mayock, Mike (2015-04-17). "Mike Mayock's 2015 NFL Draft position rankings 4.0". NFL.com. Retrieved 2015-05-12. ↑ Mayock, Mike (2015-04-29). "Mock draft 1.0: Titans don't trade No. 2 pick". NFL.com. Retrieved 2015-05-12. ↑ Brooks, Bucky (2015-04-23). "Mock draft 5.0: Mariota lands with Rams". NFL.com. Retrieved 2015-05-12. ↑ Demovsky, Rob (2015-06-17). "Breaking down Damarious Randall's contract with the Packers". ESPN. Retrieved 2015-06-25.